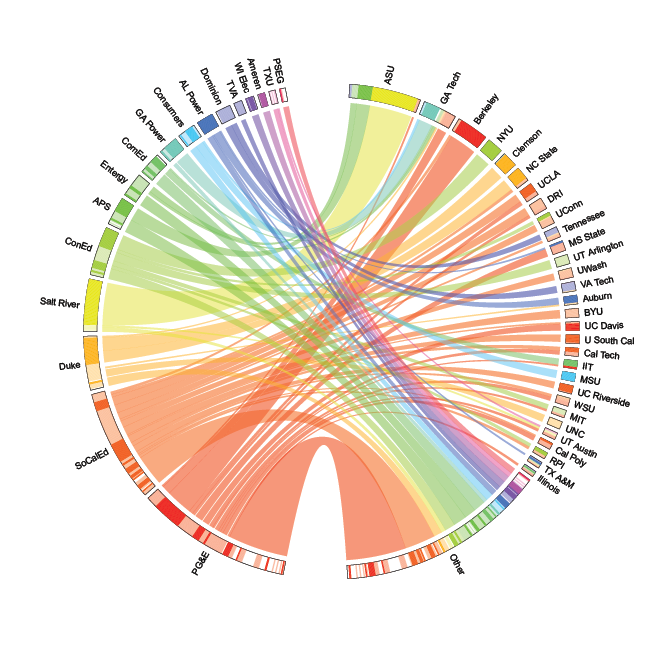 How do research collaborations form between electric utilities and universities? What causes them to succeed or fail? What opportunities exist to expand and improve these partnerships? The Energy Transition Lab, with support from Lee Penn’s renewable materials research team, decided to investigate. 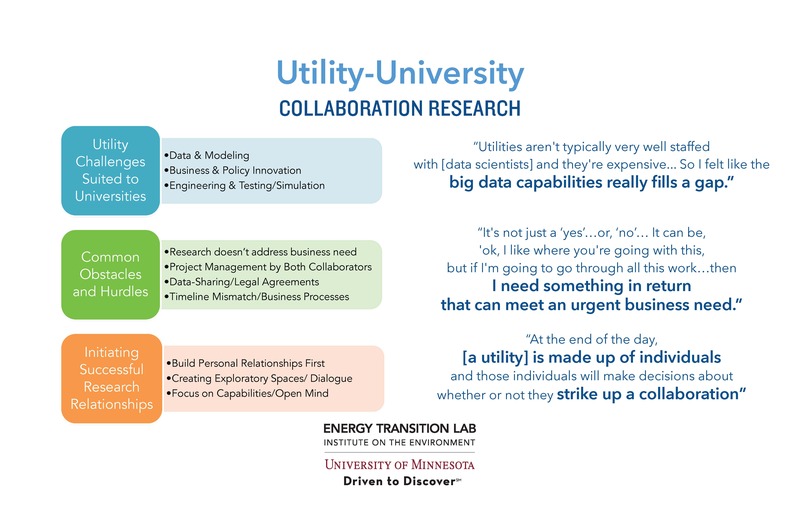 Utilities rarely deliberately seek collaborations with universities, and when they do, it’s often through informal social connections: former professors, researchers doing work for a different group or department, or an acquaintance made at a recent conference. This tendency seems largely unintentional, as consultants are considered the “default” option in utility processes. Utilities value researchers who can project manage. A willingness to work through legal negotiations, address data sharing/security, manage timelines, ensure team continuity, and maintain open channels of communication are critical to partnership building. 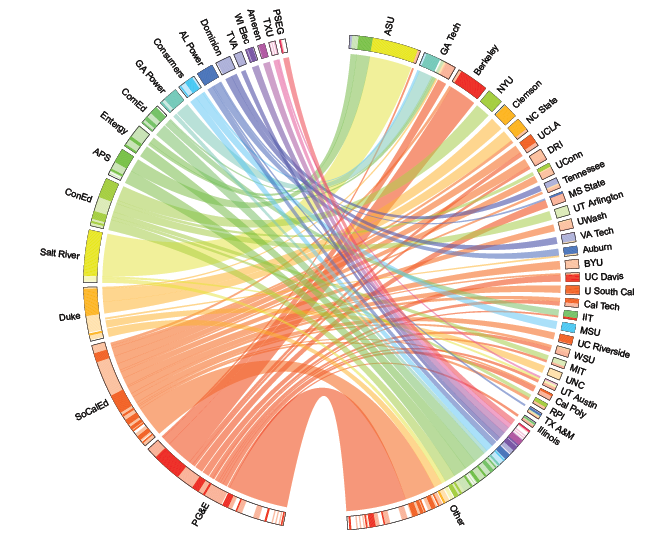 Though utilities tend to strike up most collaborations with nearby universities (and vice-versa), the most successful repeat collaborations between individuals buck this tendency. Given the importance of project management, this suggests that the intangibles that contribute to collaborator fitness can far outweigh geographic obstacles. Utilities expressed that their biggest opportunities involve the “tidal wave” of data. 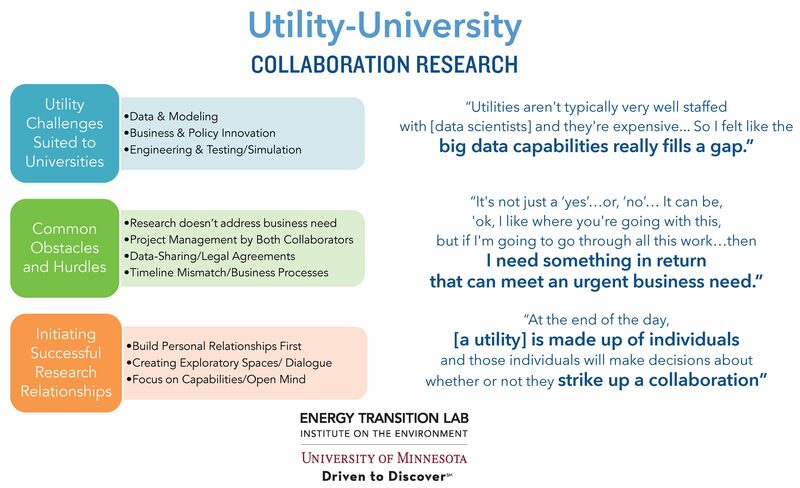 Not only do utilities lack data expertise, but our interviewees also highlight the ability of universities to “follow their nose” in an open-ended manner as a core benefit. As a slow-moving industry in an era of rapid change, utilities feel a real need for policy and business model innovation. Our advice for researchers and professors interested in striking up a collaboration with a utility is to first and foremost, ask! Start conversations and utilize any social connections you might have. When you do have those early conversations though, focus on capabilities instead of interests; this will keep the possibilities open, since research interests don’t always align with actionable business needs. And if you’re lucky to get a collaboration off the ground, be sure to cultivate the relationship, and not just the project.Utility collaborators like to find imaginative ways to continue successful partnerships once they find one. We found evidence of repeat collaborations stretching out over decades, so the sky really is the limit. Preliminary Results Below. Full study coming soon!